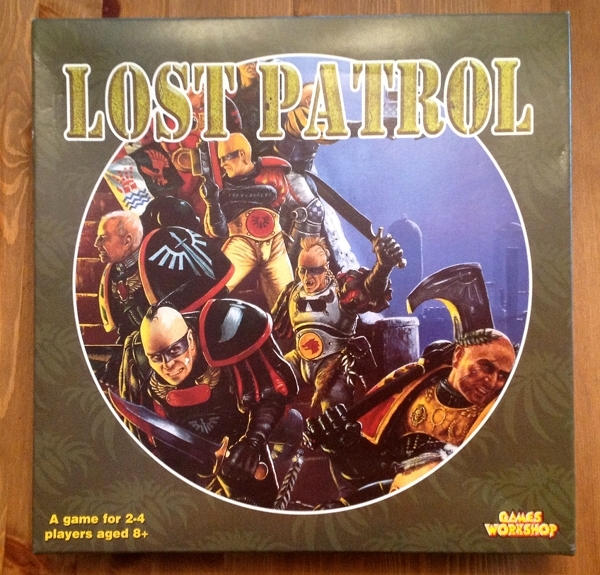 Lost Patrol is a 2-player board game about a group of Space Marine Scouts, lost on a jungle Death World. One player takes the Scouts and the other the Lurkers. The game was published by Games Workshop and a limited run was released in 2000. I have always wondered about the origins of the “Lurkers” and their role in the Warhammer 40K Universe. How did you envisage them? And, would you care to elaborate? The lurkers were based on the old horror movie principle that things are usually scarier if you don’t show them clearly. Having them as barely seen teeth and glowing eyes allows everyone to imagine them as scary in a way that would be far less effective if they were models. I’m sure that they’d be tempted to do models if they ever re-released the game, but I’d personally leave them as counters. In “reality” I always imagined them something like the mirror demons in the Solomon Kane film – emerging from the forest in a flash to grab a victim and disappear again. Thank you – and much appreciated! damn, I never even knew this game exsisted! Over at “BoardGameGeek” there is now an entry for a new edition of Lost Patrol by Games Workshop which supposedly has a release date of 17th June 2016. Are you aware of this second edition? Or, is it news to you as well? News to me. Interesting news though. WHich are the box dimensions? Can’t recall offhand, and I’ve not got a box with me to check. From memory, I’d say that the old box was about 30cm square. No idea about the new one. Hi Jake you get a chance to pick up the new version of Lost Patrol yet? My initial thoughts are it’s very very hard maybe too hard. I’m thinking it’s more fun (still very hard) if the scouts get double or even triple the number of dice for shooting and assault results. Have also been wondering if limiting the number of genestealers that can appear a turn (or the number that can appear on a tile) might make the game more tactical for the Nid player. When you get a chance would be great to know your thoughts. It’s certainly not the same game you designed though it shares a lot of the same DNA. Played 20 games yesterday as Nids, won every game, not even close. Played 20 games today as Scouts, got the Drop Pod out twice but couldn’t win. LP was always intended to be hard for the scouts (it was set on a Death World after all). However, I’d expect at least some SM wins out of that many tries. I have finally got myself a copy of the new edition, and will take a proper look at that next week. I was going to look at it this weekend, but I left it in the office by mistake. Doh! Not having played it, I can’t say whether the rules changes have made it easier or harder for the scouts. If GW had let me make the changes I wanted to for a new edition it would have been a bit easier. Sadly that didn’t happen. I do have some house rules from the first version though, and will see how many of them still work. Generally people seem to be having fun with it at the local LGS, though general consensus is it’s probably a bit too hard for the Scouts straight out the box. So house rules are being tried. Can’t wait to hear your thoughts on it when you get a chance. Been trying giving scouts more dice for shooting and assaults, double the amount (2 for shooting and assaults, and 4 for shooting the heavy bolter), or triple the amount (3 for shooting and assaults and 6 for the heavy bolter). For shooting each 6 is a kill so you can kill more than one stealer with a shot if you get lucky. In assaults you pick the highest role and work out the results from there. Double number = medium mode. This is a neat system as you can adapt the rules to your audience. E.g. On Monday I played with some teenage boys we started with medium mode, which they found too hard so then they tried easy mode. It’s just a nice way of setting the difficulty and challenge you want. 1. Remove the -1 in assaults if a scout is alone. I like this as it means a lone scout can survive if alone and fighting 3 genestealers, though his chances are still slim. 2. Don’t let genestealers enter on the drop ship tile. Thanks Joel. I’ll need to read the new rules to see what changes they’ve made. My original intention was to make the SM player feel outclassed, and as that’s Space Marines it implies a very nasty bad guy indeed. All rather weakened by sticking stealers in, I’m afraid. Yes the lurkers as an unknown foe are a lot more terrifying. Genestealers are really only a threat to scouts due to their weight of numbers. On the bonus side we now have rules to play Lost Patrol with lurkers and with genestealers. On a side note, the second edition Tyranid Codex had a great piece of fluff about a Catachan Patrol being picked off one by one by a lictor. As a kid I used to read it over and over again as I loved the story so much. I’ve always wanted to recreate the scenario as a game. I’m starting to think Lost Patrol tiles/style of rules might be the answer. Whatever the game is it needs to provide the conundrum of if we stick together we are safer, from the unknown enemy but it will take us longer/we might not achieve our goal. You ever had any ideas for a hunter style game, where one side is being picked off one by one and they have no idea where the enemy will strike next? That was the original LP. The lurkers are a sort of amorphous representation of an unseen threat which could be a single very fast creature, or several smaller ones. Hi, good ideas, Joel! I have unboxed and played the newer LP many times now, and while I love it, it definitely wants some “balancing” in favour of the scouts once the shock and mirth of the “total party wipes” gets old. I agree with prohibiting Drop Pod ‘stealer placement, and rolling extra dice is a nice way to establish a deadlier firing curve, rather than simply changing the hit rolls to 5 and 6 for kills, which I tried first for a few games. I wanted to respond to your comment specifically for that rule, as I see its addition is important because it changes more than just % of hits, it changes how the game is played. With the hits as they are (1D6, 6+), the marine player has far more chance of winning the game by forgoing all shooting and simply dashing in multiple directions to turn over as many tiles as possible. While sticking together, the marines find themselves easy targets of getting pinned between ‘stealers and wiped out in a single turn. Even in these dense formations they hardly have enough damage output to slow the enemy. The addition of the shooting improvements allows players to choose which style to play, and have the choice between frantic exploration or stoic defensive tactics. So I support better shooting odds, it promotes different play. All models can lend Covering Fire of +1 like the Heavy Bolter, while the Heavy Bolter lends +2. Bonuses are not cumulative. This encourages splitting up, by keeping the sense of fire-support. Scouts and Heavy Bolter Scouts can move and fire as a single action, using half dice (1 and 2 respectively) at 6 to hit. Genestealers can ONLY spawn from Infestation Nodes, which are placed using the same rules as placing Genestealers. This prevents dropping 3 ‘stealers on a hex and then assaulting the same turn, as the Node placement takes an action. This last rule I love. It promotes the Genestealer player reserving models from turn to turn for bigger assault pushes, or forces them into less deadly assaults if you want to keep up a steady stream of pressure on the Marine player. This lengthens the game slightly, and gives the ‘stealer player some deeper thinking to do. Additionally, it promotes using the Infestation Nodes (which are currently totally superfluous). Anyway, good ideas, glad I found this thread! Thanks for the ideas I’m going to try these now. Particularly like the look of the genestealer idea, as it sounds like it should make playing the stealers a bit more interesting, as your going to have to think a turn or two ahead. Heya Joel, since last time i typed, I have settled on a rules addition that favours the Genestealers maybe… 5 to 1? I think other reported wins of 20 to 1 were probably folks getting to a single win at 20 games and figuring that was the statistical spread. I think those were flukes, and you could easily play on another 40 games without a win. So my “nerf” of the aliens and buffs to the marines to get a solid one in five win for the scouts feels feels right. I feel like I made them too good, but 7 games in a row before the scouts got to the pod is pretty hard for a competitive game! I won;t bore you with all the changes, but the theory behind it was that the play for the Stealers was pretty boring. I decided giving them some extra options was key, and so gave them a +1 to Assaulting through tile edges that are impassible to scouts (they are rolling a D6 for the assault per stealer model). this would prompt them to move around more. I also disallowed placing them adjacent to scouts, but ANYWHERE else. I felt that they had so few options the other way, that their whole game was simply getting lucky with lone marines near revealed path exits and jumping them with 2 or 3. As the rules are now, the genestealer player is more mobile, and can be craftier for that assault bonus…. plus the overwatch rule. suffice it to say, the rest of the rules are some very impressive buffs to marines, which on paper look horrifying, but on the table it’s still a hopeless gun battle to the drop pod. Yeah true! If GW really had to replace the lurkers, lictors might have been a better choice than genestealers. I think the difference with the lictor game I have in mind, rather than the lurkers is I wouldn’t want the hunted to know where the hunter will strike next. Where as putting the lurker counters down means they know where the trouble is brewing. Of course that brings in a lot of potentially overly complex secret movement rules, which are often messy. So the lurker counters are a rather elegant compromise in my eyes. Hidden movement is usually a compromise as it’s tricky (and often requires extra components and/or a referee) to do well.